I just installed Ubuntu 16.04 LTS on a relative’s laptop (HP Pavilion G6, in case it matters) alongside Windows 8. So far, everything works so well (*) that Ubuntu doesn’t want to shut down. If I click on shutdown, the user session ends, and nothing happens. If I type in a terminal “sudo shutdown -h now”, the desktop freezes, and nothing happens. The only way to power down the computer is to press the power button. No problem, I thought when I first realized this. Theoretically, this should never happen in 2016, in any Linux, ever: but surely, two months after its release, a distribution so popular will have sorted this bug anyway, and there will be a sure fix for it. Any help is appreciated. Not to me, to Canonical and Ubuntu developers. 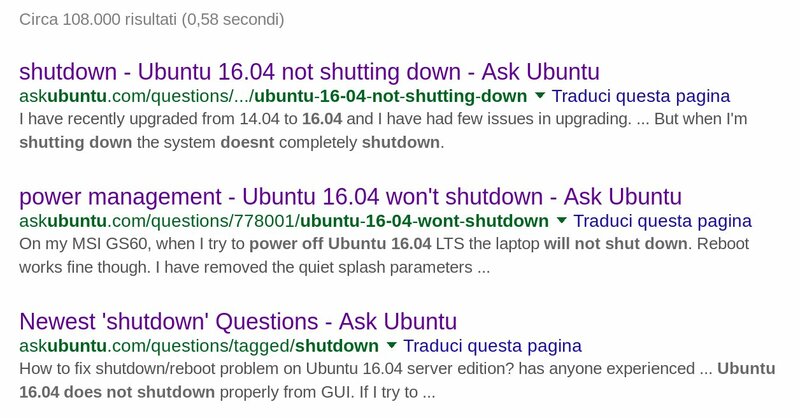 Me, I’ll just wipe out Ubuntu and install some other Linux distribution, if I don’t get this sorted out without wasting more than ten more minutes the next time I have access to that laptop. (*) except one other thing, that I will mention in a separate post if I don’t sort it out soon. Now this “no shutdown” thing is the most important.